14 Things to do for Free in Singapore. What to do in Singapore. Although Singapore is the most expensive city in South-East Asia, seeing it doesn’t have to be expensive. 14 Things to do for Free in Singapore. The Merlion is the symbol of Singapore. The original statue is located in the Merlion park which is a popular tourist attraction. The statue is 8.6 meters high and is spouting water in the Marina Bay. 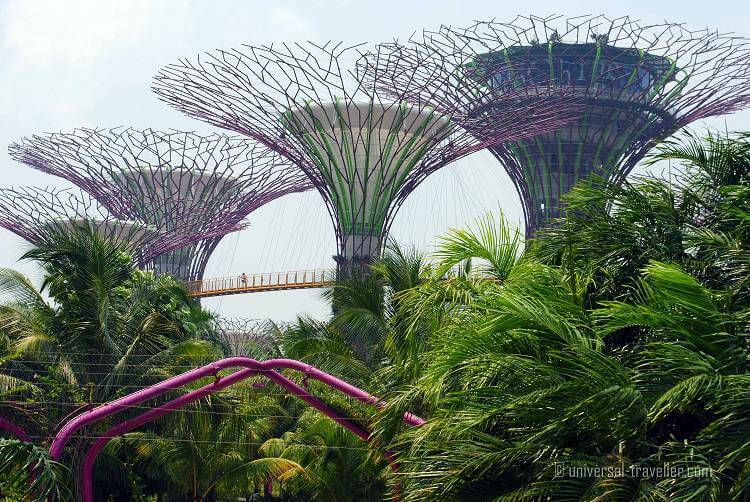 The Gardens by the Bay extend over 101 hectares and houses more than 250 thousand plants. In the gardens you will find 16 Supertrees that are connected by a 128 meter long walkway. The entrance to the garden is for free, when you want to go up on the walkway you however have to pay 5 SGD. 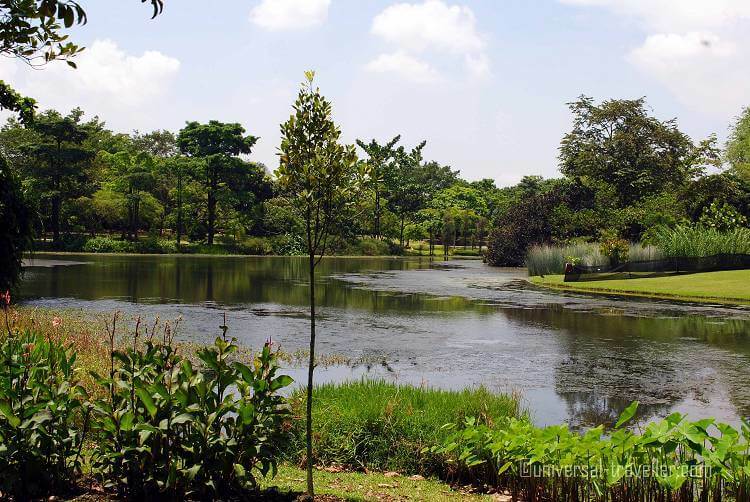 The Botanic Garden is a nice place to escape from the hustle of the city. Within the area is the National Orchid Garden with a huge array of various orchids. The Entrance to the Botanic Garden is for free, for the Orchif Garden adults have to pay 5 SGD, students 1 SGD and children below 12 years have free entree. 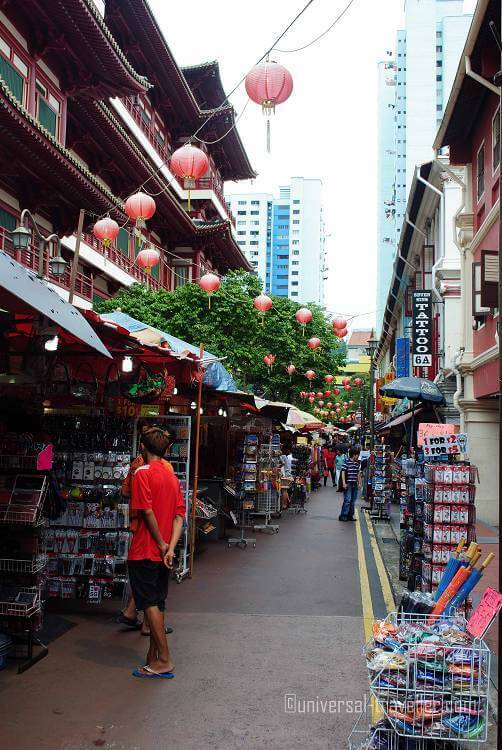 China Town is the original location of Chinese settlement in Singapore. You can find many small shops and cheap places to eat. It is the center of Chinese culture with several temples. 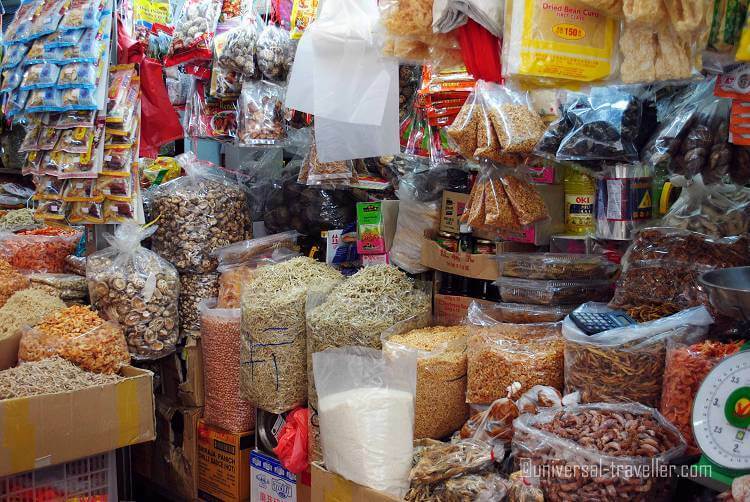 In little India you can find many small shops selling flowers, spices, massage oils or fabrics. It is also a good place to eat traditional Indian food for small money. 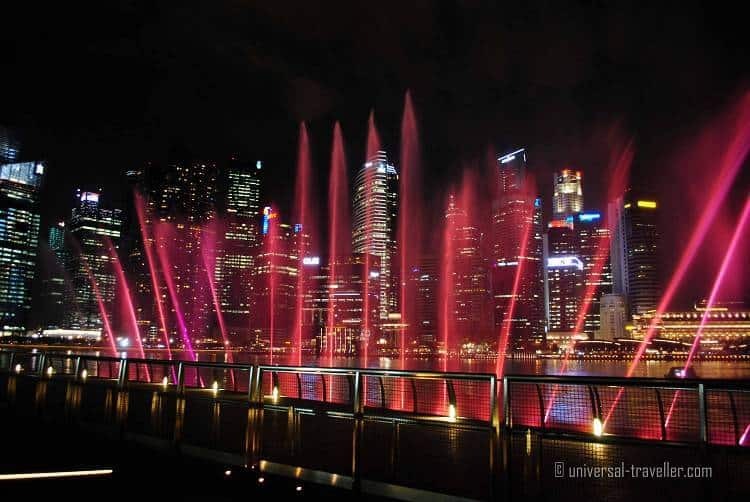 The Marina Bay Light & Watershow combines five elements: water, light, fire, audio and video. The show takes fifteen minutes in which the story of a man’s journey to life is shown. Photos and videos are projected on water fontains and music and laser light create a nice atmosphere. The show takes every day place at 8pm and 9:30pm. On Friday and Saturday there is an additonal show at 11pm. 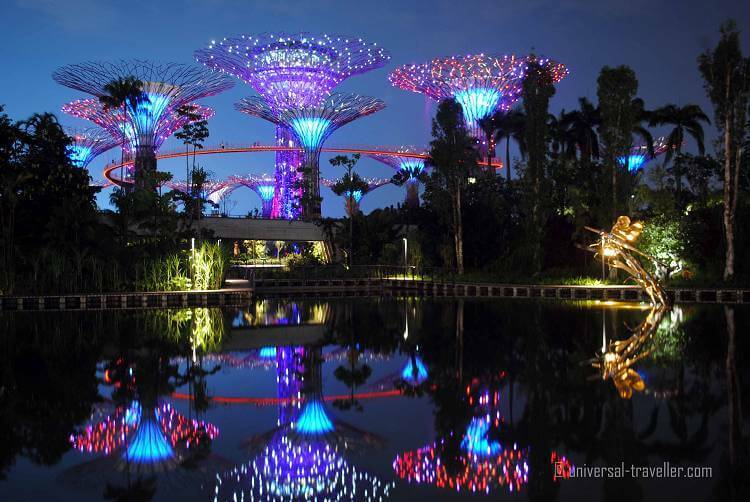 The Lightshow in the Gardens by the Bay takes every day place at 7:45pm. 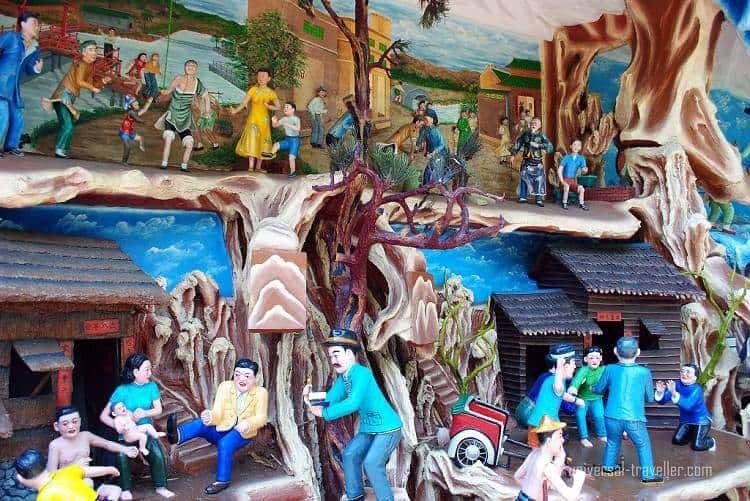 Haw Par Villa is a theme park in Singapore with more than 1.000 statues and 150 dioramas inspired from Chinese folklore, history and mythology. Vivocity is the largest mall in Singapore. 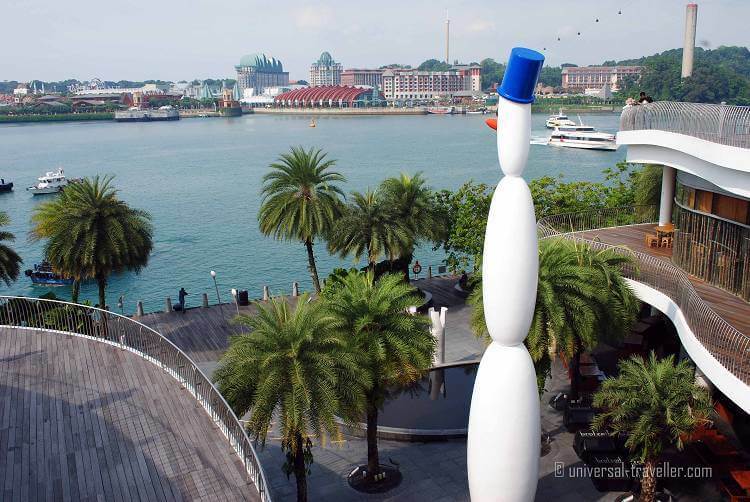 On the roof, there is a landscaped area with a nice view on Sentosa Island. 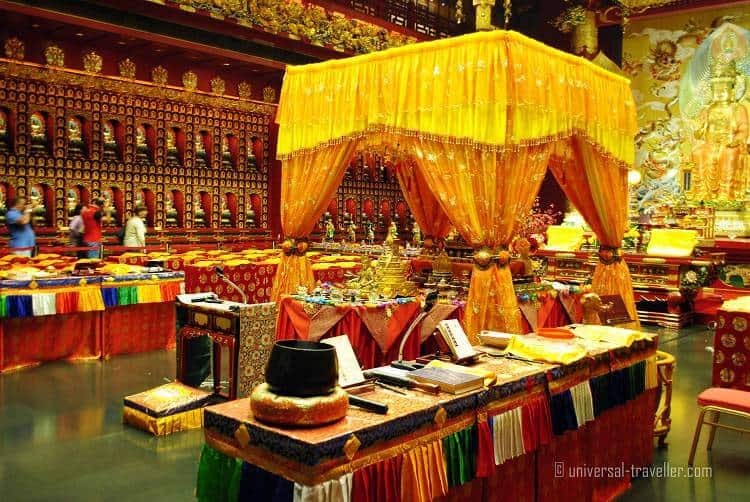 One popular temple in Singapore is the Buddha Tooth Relic Temple in China Town. It is based on the Tang Dynasty architectural style. Further temples are the Burmese Buddhist Temple, the Sri Krishnan Temple and the Sri Mariamman Temple which is Singapore‘s oldest Hindu temple. If you want to visit the Marina Bay Sands Skypark, adults have to pay 20 SGD and children between 2 and 12 14 SGD. When you however go up to the Skybar, you only have to pay for your drink. From the bar you can see the famous Infinity Pool and enjoy an awesome view over Singapore and Marina Bay. 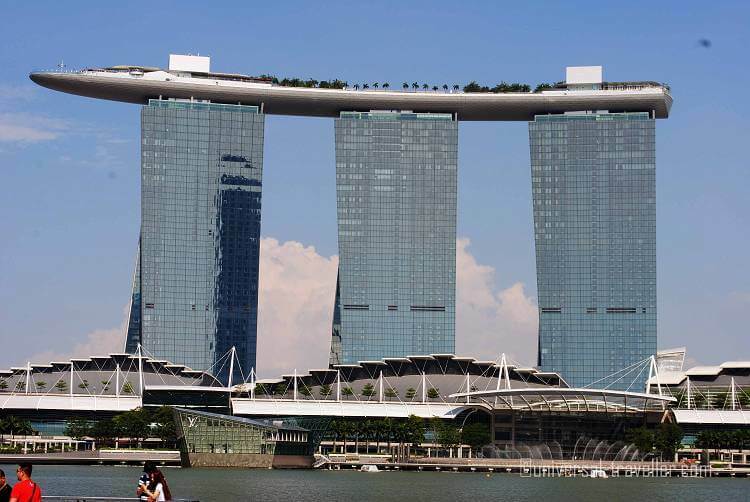 Marina Bay area is developing into a popular and modern tourism hotspot. The Boardwalk is predestinated for long walks or jogging. It offers a variety of restaurants, bars, clubs and shops. 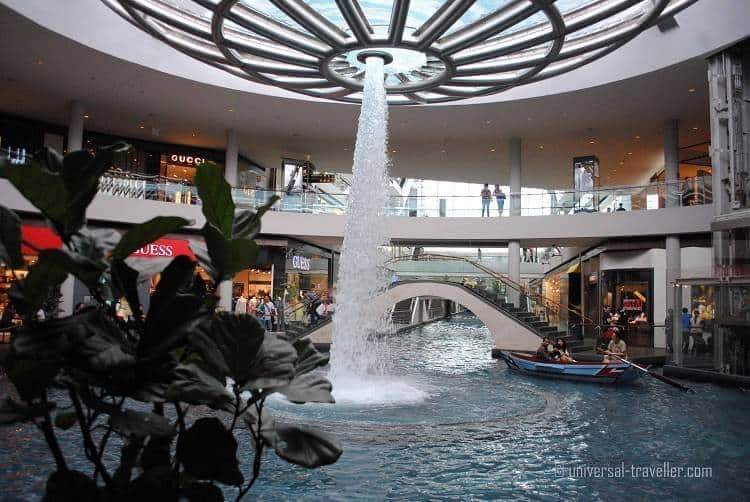 The photo is taken in the Shoppes at Marina Bay Sands, a huge Shopping Mall. If you do not want to discover Singapore on your own, you can join one of the free walking tours by Singapore Footprints. It is a group of young and enthusiastic students who provide fun, interactive and experiential tours. The City Gallery is located on the waterfront of Marina Bay. You can inform yourself about the latest developments in Singapore and current plans. 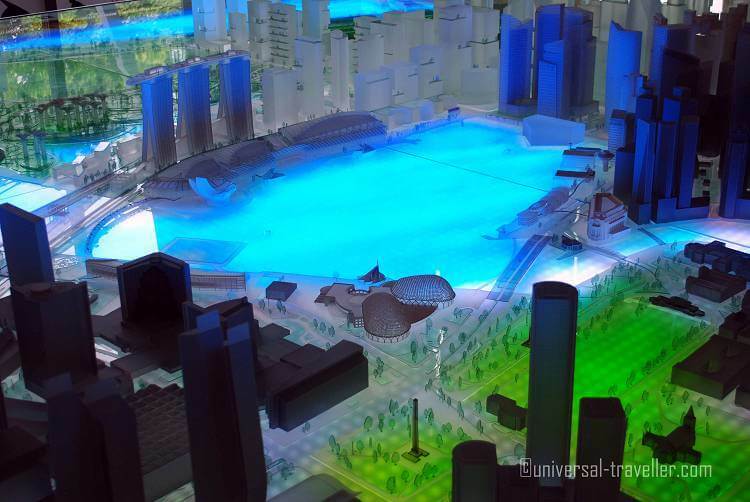 A city model gives you an overview over Marina Bay and provides information about the different buildings and landmarks. An interactive timeline that goes back to 1800s shows you the development of Marina Bay.